Most commercial buildings require three separate water lines – an irrigation line, a domestic line and a fire protection line. Each of these water lines needs a separate backflow preventer to keep the downstream water safe from a backflow event. Different rules apply for which type of backflow preventer is required for each of these three water lines. These days, most states require an RPZ type assembly for irrigation use. RPZ type assemblies are becoming increasingly common for both domestic and fire protection service. Many engineers and architects prefer multiple backflow preventers to be located inside one larger aluminum building, rather than a separate enclosure for each protected water line. This makes sense for several reasons. It is more economical to purchase one wider enclosure instead of two or three separate enclosures. Most manufacturers have standard models to handle dual (side by side) backflow preventers. The single cover for multiple backflow preventers is more aesthetically pleasing than multiple enclosures on the property. The view for the extra wide enclosure is the same from the road as the largest of the three enclosures for the water lines. This is a big deal with most architects and property owners. Having two or three of the backflow preventers inside a single enclosure makes maintenance easier, because all the backflow preventers are in one place. Most aluminum enclosure manufacturers have an access panel on each side of the cover, making testing and maintenance accessibility easy. You can see below two examples of multiple devices inside one aluminum enclosure. Click on them to see them larger and more clearly. For both of these systems, Safe-T-Cover was able to use one of our standard models. The first is a 1000T-AL, and the second is a 600DS-AL. As you can see, it's possible and even common for manufacturers to have standard models wide enough to fit dual backflow preventers. What questions need to be answered if you decide to place multiple backflow preventers inside a single aluminum enclosure? How far apart do you want the backflow preventers? Many people want the backflow preventers spaced 8” or 12” apart. Some want them 18” apart. Sometimes the specification reads 24” distance from centerline to centerline. This is a question for the design engineers. Do I need room inside the enclosure to walk around the perimeter for easy testing and maintenance? No. Most enclosure manufacturers have an access panel that is at least 36” wide on each side. Access for testing and maintenance is easy. How do I know which size to specify if I want to put two or three backflow preventers inside a single enclosure? You need to call your manufacturer and have them properly size the cover for you. Some manufacturers have standard “dual” size boxes that can accommodate two or three backflow preventers. In some cases a custom enclosure will be needed. 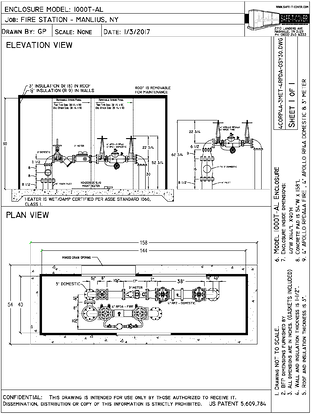 Can I place two “compact design” backflow preventers inside a standard sized enclosure? Yes, generally you can. Call your enclosure manufacturer to be sure. It makes sense to use a single aluminum building for multiple backflow devices. Sometimes, two or more backflow preventers will fit inside a large standard sized enclosure. However, Safe-T-Cover can make a custom enclosure to fit your exact dimensions if needed for multiple backflow preventers. 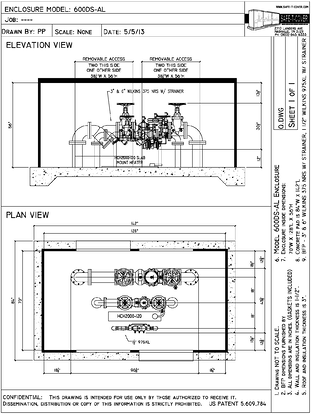 Safe-T-Cover has created drawings for many jobs that required multiple backflow preventers inside a single enclosure. Over the years we have created hundreds of designs for multiple devices inside a single enclosure. Please reach out to us to see if we already have one that matches your specifications, or to work with us on creating a new one specifically for your requirements.